I have been using Just Whites whenever I've made royal icing for my sugar cookies. The truth is, none of us like the taste very much. I Am Baker posted a royal icing tutorial this week. I printed it out and made her icing recipe. It tastes much better and is so simple! 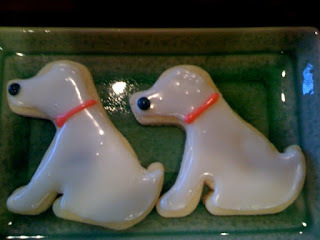 I made some last night and frosted a bunch of dog cookies. They were a disaster! I tried again today. This time I did not rush myself. I have to say....I love the results! They were almost too cute to eat! These boys remind me of Buddy! Sweet boy...I miss him. Check out I Am Baker's Oreo Cakester Petit-Four goodies. These look yummy! Those ARE adorable. Almost too cute to be eaten. Nice job! Those are GORGEOUS!!! Fantastic job!! You are *really* talented! That is such a simple yet beautiful design... I am so proud of you for not giving up!